A gilded bronze box of peach form, supported on a short, straight foot. The slightly domed cover is fully decorated in relief with figures in a landscape setting. A large pavilion with a wide patio occupies the cover, and its roof, railings and well-decorated interior are depicted in minute detail. A group of literati are viewing a scroll painting inside the building. The eight Daoist immortals are depicted in different locations: Zhang Guolao with a fish drum (a bamboo tube and two metal beaters) rests in front of the pavilion with a crane as company; Lan Caihe holds a flower basket in his left hand and is seen running in the foreground; He Xiangu stands at the lower left edge with a lotus flower on her shoulder and a deer by her side; Cao Guojiu has a pair of beaters, Han Xiangzi is playing a flute and Han Zhongli is holding a fan. All wait for Li Tieguai with an iron crutch and Lu Dongbi with a flywhisk to arrive from the sky, surrounded by swirling clouds. The remainder of the space is fully decorated with leafy trees, rugged stones and mountains in the distance. The sides of the cover and the base are adorned with a band of stylised birds of archaic form. The flat base is engraved with a stylised shou longevity character in a circle, surrounded by five bats. The exterior and the interior of the box are gilded overall. The box is heavily cast and has acquired a beautiful, mellow patina. The presence of the eight Daoist immortals and the peach form of this box together imply the famous ‘Peach Banquet’ of the Queen Mother of the West (Xiwangmu). The Queen Mother of the West is a Daoist deity worshipped as a goddess of longevity. Her abode is the Jasper Pool (Yaochi), high in the Kunlun Mountains. She has a peach orchard whose trees bloom once every three thousand years and whose fruit take an equal amount of time to ripen. Harvesting these peaches calls for a big celebration, so she holds a ‘Peach Banquet’ at her mountain abode and invites many immortals to attend and partake in the fruit of immortality. The size of this giltbronze box and the minute detail of its decoration make it a rare example of Qing bronze craftsmanship. 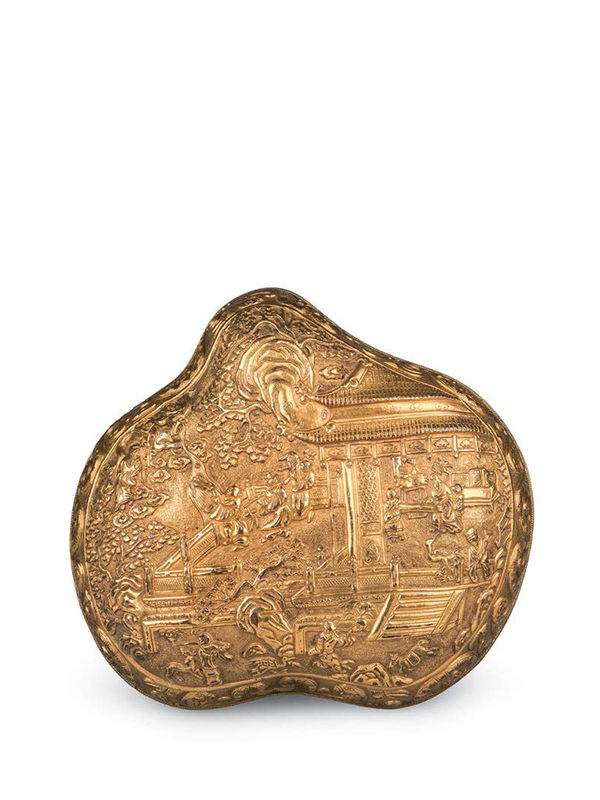 A comparable gilded bronze incense box of circular form, with a more sketchy decoration of magnolia flowers and inscribed Hu Wenming on its base, is dated to the Wanli period (1573 – 1620) is in the collection of the Museum of East Asian Art, Bath, England. A nearly identical incense box to the Bath example was exhibited in the Fung Ping Shan Museum, University of Hong Kong in 1986. 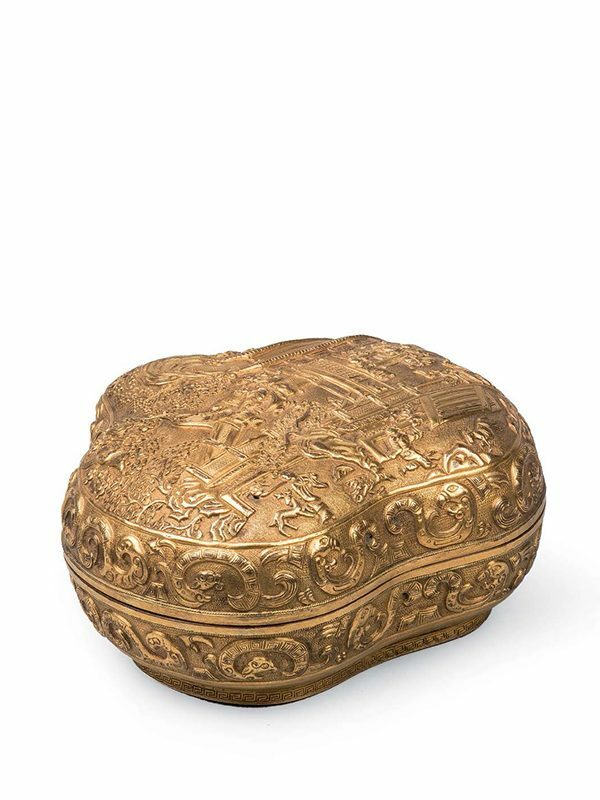 A further comparable gilded box with a decoration of lotus flowers, signed Zhu Chenming and dated to the 16th – 17th century, is in the collection of the Victoria and Albert Museum.